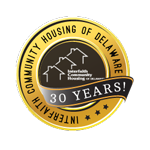 Interfaith Community Housing of Delaware, Inc. (ICHDE) has served the Delaware community since 1968. Though there have been variations in the mission throughout the last half century, the agency has consistently remained steadfast to the purpose of empowering low- and moderate-income families through first-time homeownership opportunities and homeownership services. Historically, the work accomplished at ICHDE has unceasingly been focused on low-income families and their housing – and to a larger scale – the neighborhoods and communities in which they reside. In 1999, ICHDE became the first chartered NeighborWorks® America organization in Delaware, and in 2005, ICHDE opened Delaware’s first certified NeighborWorks® America HomeOwnership Center (HOC). ICHDE is a small agency that quietly serves Delaware’s low- and moderate incomes families and communities at-risk. ICHDE is an agency with the consistent, sustainable, and meaningful successes and outcomes of similar agencies which are larger in both budget and staff. Its colorful history is rooted in its constant attention to mission which focuses on the revitalization of neighborhoods and empowering families towards first-time homeownership opportunities and homeowner services such as default counseling, financial education, credit management and credit repair. In addition, the agency is now establishing a WorkForce Development program with the goal of helping to train and equip reentering ex-offenders, which ultimately leads to steady and stable employment. Through the facilitation of empowerment and support, clients and residents can emerge as the solution and be the cause of positive, sustainable community change.